We Have to Keep Asking: Why Did It Take So Long for the Military Aircraft to Get Up in the Air and Fight the Fires? 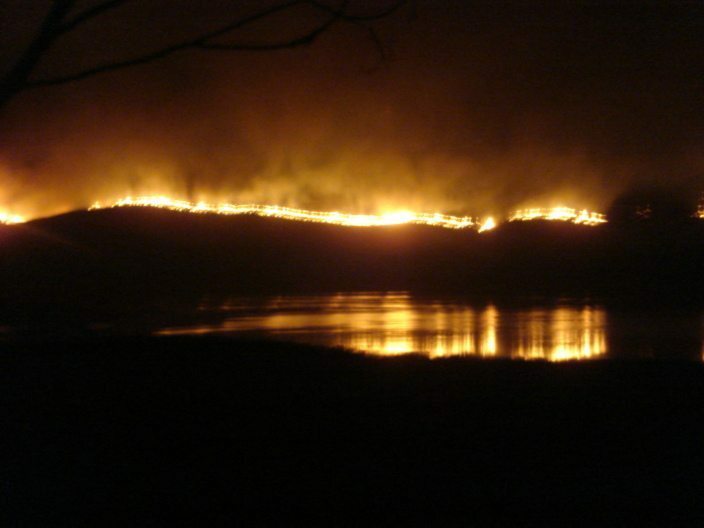 It was before sunrise on Tuesday morning, the 23rd of October, the third day of the fires. Patty and I sat on the edge of Sweetwater Reservoir, watching a spectacular line of orange flames that had crossed the entire flank of San Miguel mountain. The flames were marching down the side of the slopes toward Spring Valley where her mother lived. It was the night the entire mountain burned. The flames could be seen from across town and San Miguel burning was the big news of the night. Only twice before in living memory had flames reached the top of the mountain, during the Cedar fire in 2003, and way back during the Laguna fire in 1970. Neither time did the flames crest the mountain like this and continue down the western side toward where people lived. I thought to myself, I sure hope the planes and helicopters are up today as this whole county is burning. Later that morning, we were relieved to watch as two Navy helicopters methodically dumped buckets of reservoir water on these flames. Fortunately, the fire never reached Spring Valley proper. However, as the day progressed with the county being ravaged by the wildfires, I — along with probably thousands of others anxiously watching the skies for relief — became shocked — and disgusted — that no other military aircraft came to San Diego’s rescue that day. That was the day that the number of houses burned to the ground went from a few dozen up into the hundreds. That night on the tube, at one of the press briefings that local government officials held, three Congressional representatives, Darryl Issa, Brian Bilbray, and Duncan Hunter were pressed by local reporters about the absence of the military aircraft. It was then announced by the Congressmen that the issue was resolved and that military pilots would be flying out and attacking the flames at daybreak that very next day — Wednesday. The representatives — all Republicans — disclosed that they had been forced to intervene between U.S. military and CalFire aviation officials in order to broker an agreement that would allow the military aircraft to take off and attack the fires. The Congressmen reported that they had to personally arrange a telephone conversation between the head of the military aircraft, a Marine Corps officer, and the head of CalFire aviation in order to get them to agree to use the fixed wing and helicopters that were ready and available. The conversation was described as “fair but firm” and everyone that night made a little joke about it. The problem was, of course, that at daybreak on Wednesday, the fourth day of the fire, no new aircraft took off. It was not until later that day that some of the military helicopters were utilized but still none of the larger, fixed-wing C-130s were airborne until Thursday. During this time, the Witch Creek, the Harris Ranch, and the other fires were burning hundreds of thousands of acres, and hundreds more houses were destroyed. For those of us who were remember the 2003 Cedar fire, there’s a gut-churning feeling of deja-vu. Wasn’t this issue resolved — the use of military aircraft — whether Navy, Marine Corps or California National Guard– to fight the ferocious Santa Ana fires? Hasn’t the last four years enabled our government to work this out? Wasn’t County Board of Supervisor president Ron Roberts working on this? Didn’t he tell everyone that the mission had been accomplished in arranging for these military assets? Yes, we are all familiar now with the claims by our different layers of government that high winds and something called “bad timing” forced the delay of the military aircraft to enter the fray. Indeed, the winds did reportedly reach 100 mph on Monday, October 22nd, the second day of the wildfires. The request for aerial assistance by the state Office of Emergency Services to the California National Guard, once local officials had determined that the fires had grown beyond their capacity to fight them, had gone out late Sunday afternoon, the 21st, the day the local fires had initially whipped themselves up. But issues such as the time spotter crews needed to get to their take-off locations, with the state insisting first that their spotters fly with each military aircraft, and due to the large C-130s capable of fighting fires having to fly in from other states, and with the lack of federal assets being flown to the region in order to be on the ready … all prevented the timely deployment of the aircraft for San Diego. Despite our governor’s complaint about the complainers, it appears that our county — and others as well — suffered from a turf war between the different jurisdictions that have authority over firefighting aircraft in this state. CalFire, the new name for California Department of Forestry (CDF), has contracts with private pilots to utilize their own aircraft to fight fires. Whether CDF was reluctant to call in the military out of fear that the Navy and Marine Corps pilots would do a better job than their private contractors or whether there was some kind of agreement between CDF and the private pilots to allow them to get first crack of any fire … the fact is, that it took Congressional intervention at the last moment to loosen the bureaucratic rules to allow the military helicopters and fixed wing planes to be used. And even then, it took hours before the aircraft lifted off with their water and retardant. San Diego County was well into the fourth day of the fire storm before sufficient numbers of military aircraft were in the air over our corner of the country. The worst was over by then. The whole point of having aircraft is to hit the fires early before they burn out of control — like these did. Military pilots are the best. They are experienced and are able to go places in winds that civilian pilots can’t and won’t go. The Navy pilots locally were ready to go. They didn’t have the authorization and the helicopters and their buckets sat on the tarmac. It ended up taking days for the orders to come. 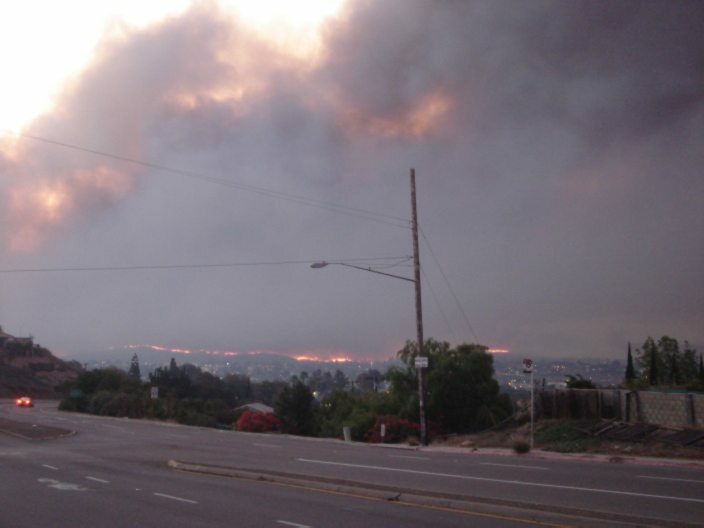 Somebody in CDF – CalFire, and higher up, needs to answer to the residents of San Diego. No more photo ops for politicians next to the charred remains of the homes without some answers. Glad to see the planes finally flew and were able to aid. Truely the fire is nasty. Luckily OB has missed the brunt of the ash, not like the Cedar fire. We do have our share of bad air. Good photos — glad you had no loses. Even in East County the ash and air were much worse in ’03. By the second day of the Cedar Fire it looked like it had snowed in my yard and that fire didn’t get as close the Harris fire did.